CGMP in full is the Current Good Manufacturing Practice. These guidelines ensure the right designs, monitoring procedures and the required control of the manufacturing processes and the facilities used. Compliance to the cGMP assures acquisition of identity, purity and high quality standards of the drug commodities by forcing the manufacturers to apply the right control measures. Adherence to the guidelines involves the establishments of strong and quality managerial systems, obtaining of accurate standard measures, establishment of robust operating system and early detection of quality deviations. Within a pharmaceutical company set-up, it reduces chances of contamination, errors or even deviations. In the long-run it assures the quality of the product manufactured meets all the set standards. The primary objective of CGMP is to make sure that the manufacturers use latest available technology. Technology today, plays a key role in every industry. With the right implementation of up-to-date software, systems and processes, manufacturing becomes more efficient especially in consistency during mass production. CGMP however gives the minimal guidelines to adhere to, and leaves the rest of the decisions to the company. This includes decisions such as which software are most efficient, what technology should be implemented in the processes, and such. Several countries have declared CGMP a legal requirement in the manufacturing industry. The FDA runs inspections on various manufacturing facilities, finished products and equipment used to determine their adherence to regulations. If the facility or finished products don’t meet the set standards the term ‘adulterated’ will be used to refer to them. In this case FDA can either advise the company to recall the goods or use legal means to seize the whole production batch from the market. This will be entirely based on the extent of violation. Anyone can access all the guidelines and updates regarding CGMP from the FDA registry posted on their website. The term GMP refers to Good Manufacturing Practice Regulations. These regulations have been implemented by the Food and Drug Administration Authority of United States. The regulations were implemented in accordance with the Federal Drug, Food and Cosmetic Act. 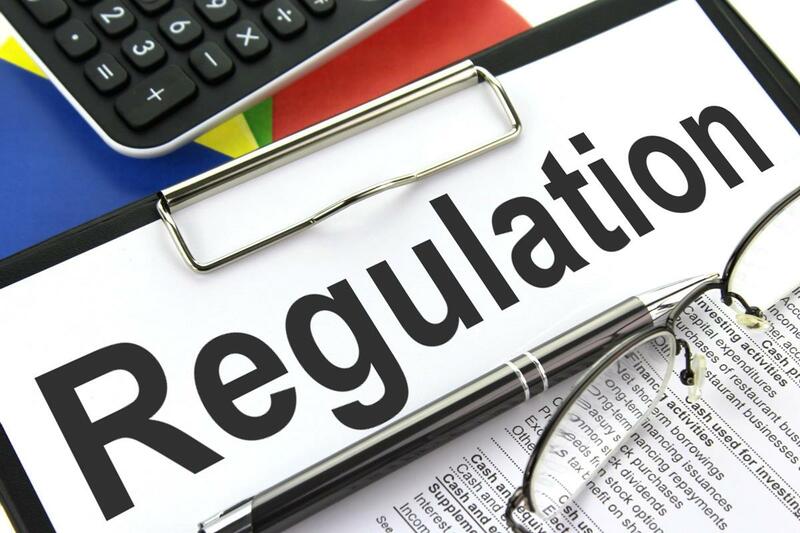 The GMP regulations are applicable for manufacturers, packagers and processors of medical devices, drugs and certain food items. The regulations will make sure that the products are completely safe for the people to use. In addition, the regulations ensure the effectiveness and purity of the products as well. With GMP, all chances available for the manufacturers to end up with errors, mix-ups and contamination are eliminated. Hence, consumers will be able to ensure safety while they are purchasing the goods. The major sectors GMP covers include building and facilities, equipment, raw materials, personnel, production, labeling and complaints. GMP covers broad guidelines that should be adhered to by all companies in manufacturing. Here, there are no options or alternatives as the prior CGMP. Are the buildings and facilities being used in suitable size and design? Are the personnel handling the processes well trained and equipped? Are the raw materials stored and handled in ways which prevent mix-ups and cross-contamination? Are there proper means of documenting production batches and records storage? The applications of GMP are broader when compared to the applications of CGMP. That’s mainly because some of the manufacturers do not use the latest available technology due to availability and cost implications. GMP is widely being used in the world when compared to CGMP. In fact, more than 100 different countries out there in the world tend to use GMP. However, only handful countries adhere to the guidelines of CGMP. GMP is widely applicable to a large number of situations out there in the world, when compared to CGMP. These applications span across a large number of industries as well. For example, GMP is used in ensuring different areas of a business, which include book keeping, ensuring cleanliness, meeting personnel qualifications and manufacturing equipment. GMP can also be used to define quality in procedures followed by a business. However, the applicability of CGMP is somewhat limited. It can mainly be used for manufacturing goods. 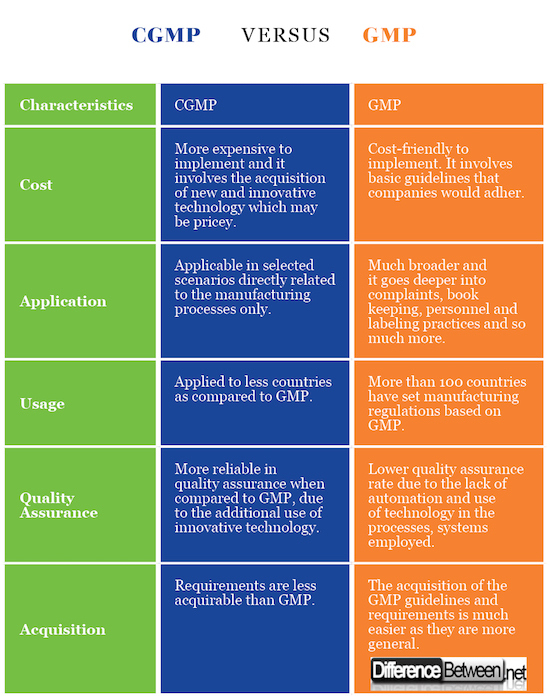 CGMP is more expensive when compared to GMP. That’s because the manufacturers will have to go ahead and spend a considerable amount of money with the objective of purchasing available technology. 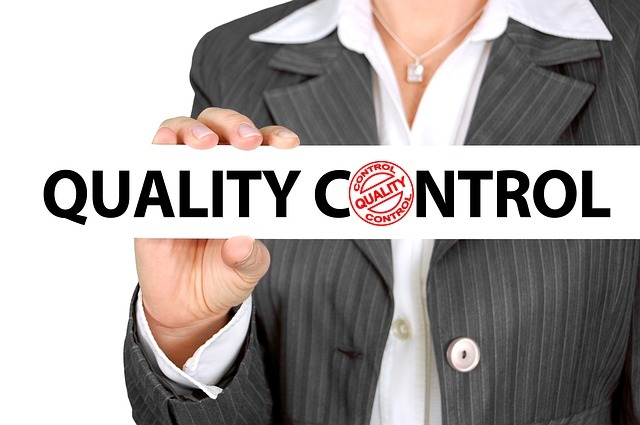 The assurance of quality with CGMP is more reliable when compared to the same of GMP. Technology ensures that the quality is met in the final product, by taking several factors into consideration. In other words, a product will be analyzed from several dimensions to make sure that quality is met. GMP can be considered as a traditional method of quality assurance. GMP is based upon the same principles but it adheres to the standards along with latest available technology. Hence, it can be considered as a more effective and efficient method of ensuring quality assurance. Due to this reason, manufacturers should think about following CGMP instead of GMP. Evah Kungu. "Difference Between CGMP and GMP." DifferenceBetween.net. April 12, 2018 < http://www.differencebetween.net/business/difference-between-cgmp-and-gmp/ >. Very useful I like it provides me the best knowledge over the country’s using the gmp and cgmp process..
Cooper, B N. Good Manufacturing Practices for Pharmaceuticals: GMP in Practice. CreateSpace Independent Publishing Platform, 2017.
Cooper, Brenden. GMP Fundamentals – A Step-by-Step Guide for Good Manufacturing Practice. CreateSpace Independent Publishing Platform, 2017. Tobin, P E, cGMP Starter Guide: Principles in Good Manufacturing Practices for Beginners. Solo Validation, Resources Limited, 2016.